bring us their latest colab, the Blancpain Fifty Fathoms Bathyscaphe Bucherer Blue, the lovechild of two already very special blue dive watches. Bucherer’s Blue Editions, cherry pick models from some of the finest luxury watch brands available today and give them a makeover using their corporate blue. 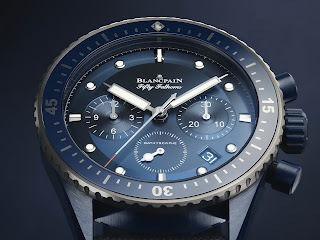 But if there is one luxury dive watch brand that is distinctly not lacking in the blue department, it’s Blancpain who have released several blue iterations of their legendary FF and FF Bathyscaphe divers over the past few years. 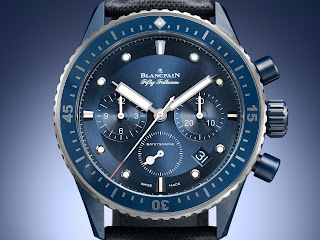 Check this one out for starters, their newest blue beauty, the BOCIII, released this summer. I digress . 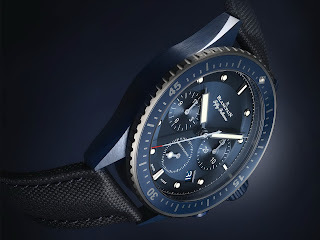 . .
Not least of which were the Bathyscaphe Chronograph Flyback Ocean Commitment and the BOCII from which this Bucherer Blue seems to have borrowed the best blue bits from. 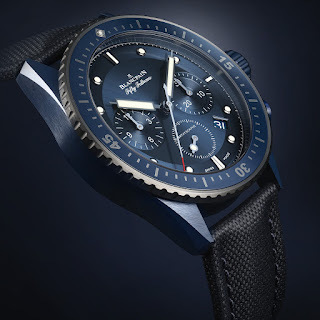 Since its reintroduction in 2013, the Bathyscaphe has been equipped with several complications, including a flyback chronograph which is now presented in an original version created for the BLUE EDITIONS. 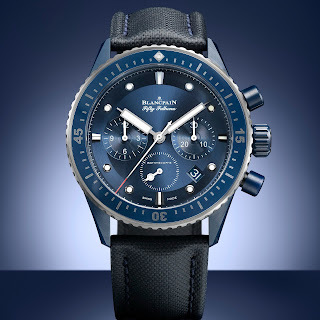 The Fifty Fathoms Bathyscaphe Bucherer BLUE EDITIONS is powered by a Caliber F385, a self-winding chronograph movement. With an oscillation frequency of 5Hz, it is perfectly suited to its functions, being able to divide each second into one-tenth intervals. The Caliber F385 also offers the advantage of a vertical clutch ensuring smooth activation of the chronograph and enabling it to operate non-stop. The F385 is equipped with a column-wheel system, as one would expect from a luxury chronograph. 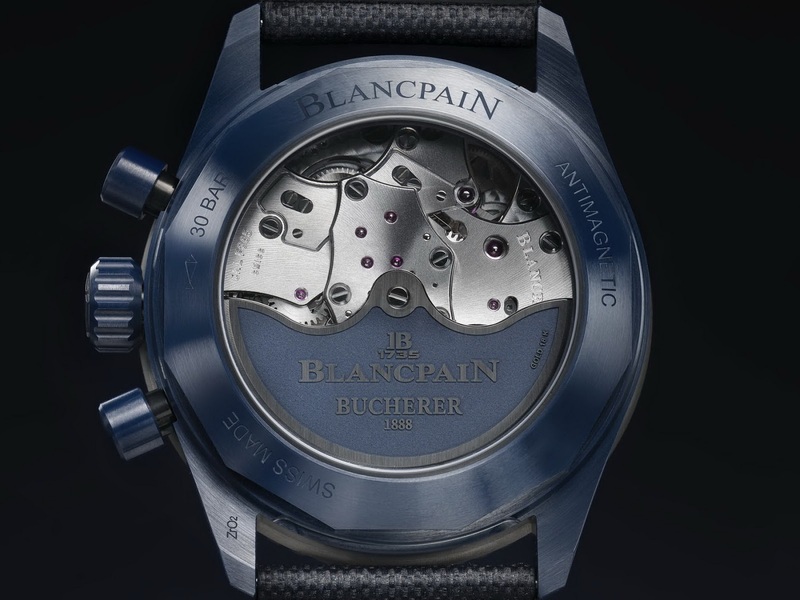 Its flyback function ensures that zero-resetting and restarting can be instantly executed by a single press on the 4 o’clock pusher. 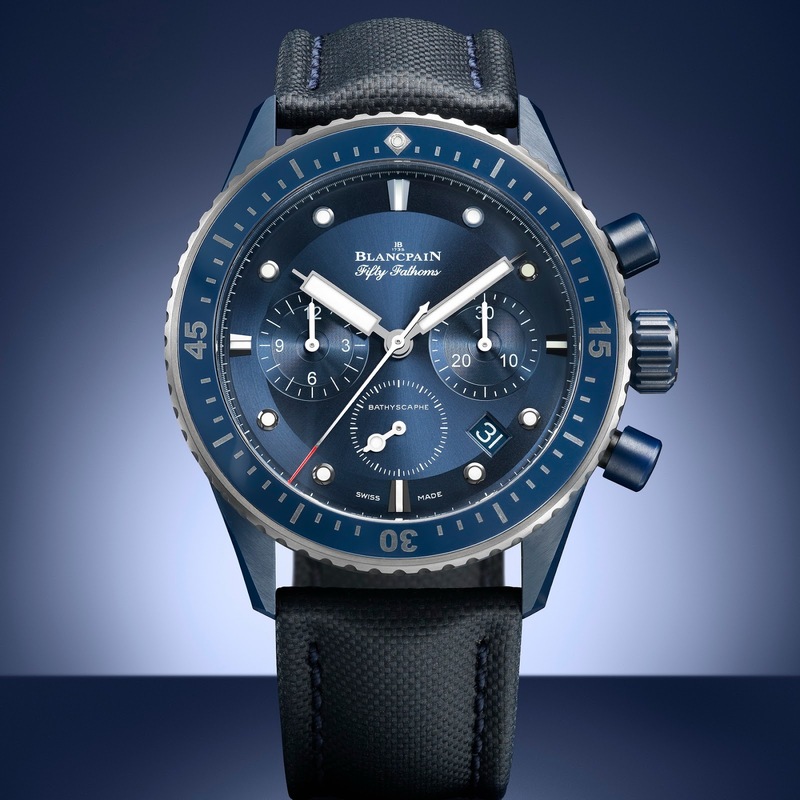 Water-resistant to 300 meters, as is the watch case, the chronograph pushers can be activated even during immersion without any risk of damaging the movement. Further diver’s features include: a unidirectional rotational bezel, anti-magnetic protection brought about by the use of an Si balance-spring rather a traditional movement with a Faraday cage and of course a stunning 43mm case. The case is made from brushed blue ceramic which sits alongside a similarly blue dial with a satin-brushed chapter ring highlighting SLN-coated hour-markers and sunburst snailed chrono sub-dials. 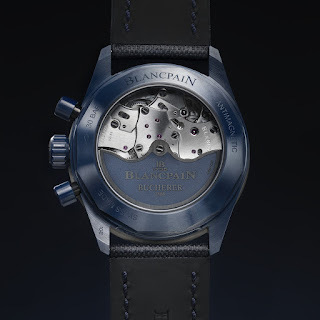 On the back of the watch, visible through its Sapphire caseback, the bridges are adorned with snailed surfaces and beveled edges. 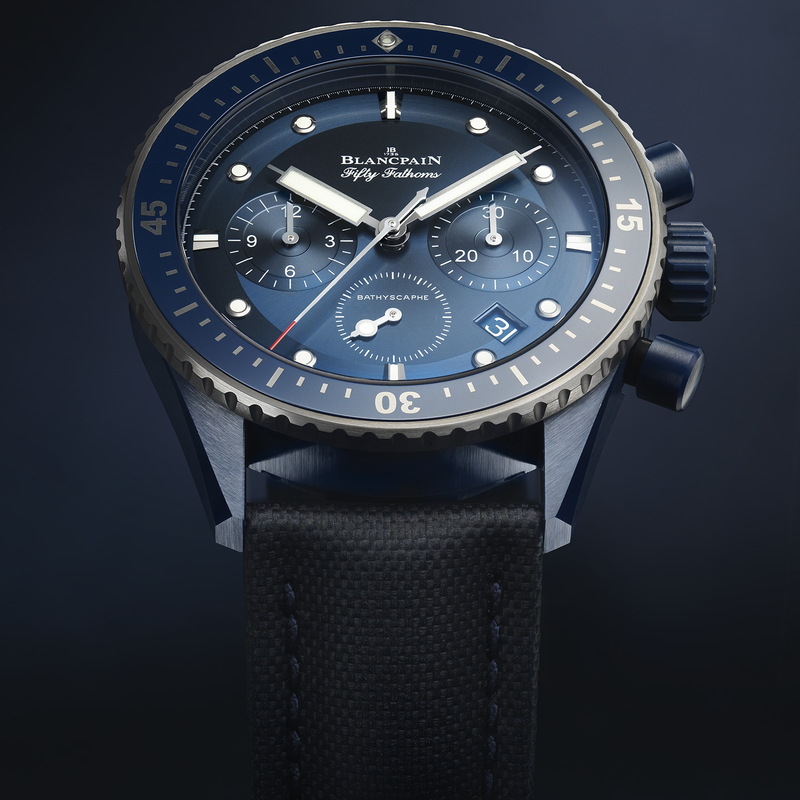 The Fifty Fathoms Bucherer BLUE EDITIONS is available exclusively from Bucherer boutiques, worldwide including their online boutique as part of their BLUE EDITIONS.